Change is the only constant. The struggle of Kashmir for independence from Indian rule is also changing as people shift their platform for protest as new media are made available. The internet has become the podium for the new generation to express their support. It was not so popular earlier in the valley; today most of the people who don’t come on to the street to protest have taken the protests in everyone’s heart to social networking sites like Facebook and video bank YouTube. The current movement of spontaneous protests in the last two months is led by the children of the conflict, born after the rebellion movement started in the valley. On Facebook, many groups and pages which support the movement are filled with pro-freedom and anti-India pictures, videos and posts. Members often raise a debate on any page or group to discuss how the current movement should be taken forward. Facebook has also become a fast means for circulating the latest news. The killing of seventeen-year-old student Tufail Ahmad Mattoo on 11 June while returning home from tuition sparked widespread protests in valley which have left more than 45 people dead so far. Tufail was killed inside a football stadium when police were chasing some stone throwers. Eyewitnesses say a policeman fired at him from close range killing him on spot. Despite a clamp down by the authorities on Facebook users who upload these kinds of posts, pictures or videos, e-protestors continue to spend hours on internet. In the Islamabad district of south Kashmir one user was called by the nearby police station to report in the station, claiming he was involved in anti-state activities on Facebook. 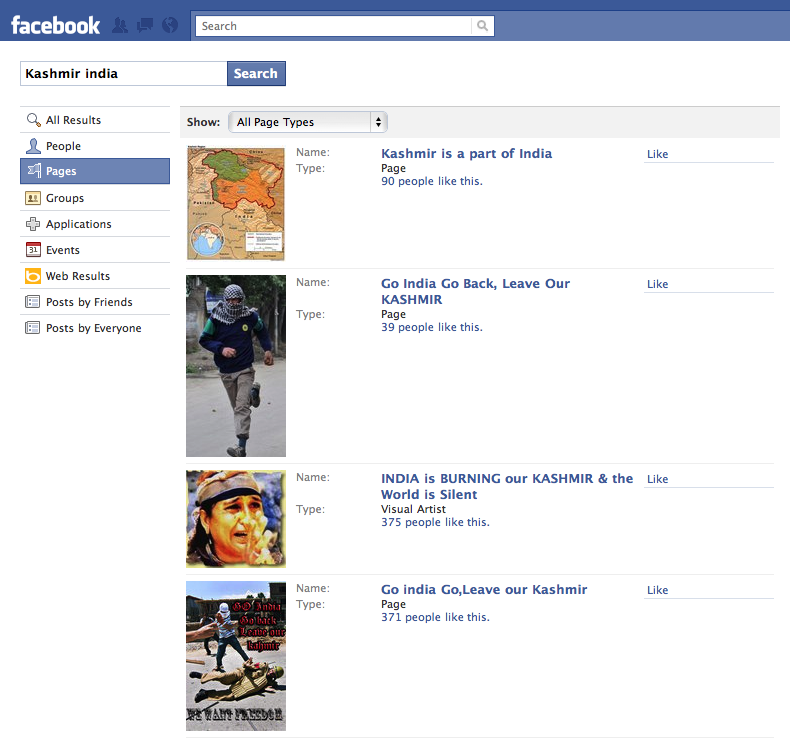 The contest for Kashmir goes viral. Some of the many dedicated Facebook pages. From social networking sites to the street, people of the valley have become keen participants in graffiti protests by sketching pro-freedom, anti-India slogans in graffiti on roadside walls, shop shutters, electricity poles, tree trunks, and roads leaving no space which does not mark their protest. These graffiti protests started in response to the protest call given by a pro-freedom group, Hurriyat Conference (G), headed by its ailing Chairman Syed Ali Shah Geelani who recently returned from the hospital where he was undergoing treatment while arrested. I ask him if he feels under threat: “Yes I feel scared of being caught someday but one has to struggle to achieve something,” he says, adding further that the J-K police and Central Reserve Police Forces have erased most of his sketches by painting them black. “Last month I made nearly 60 sketches in the city but just four of them could survive,” he said. On the internet also many social networking sites like Facebook are dotted with messages like ‘Go India Go Back’, ‘Leave our Kashmir’ ‘we want freedom’ and many quotes and poems related to the death or war. Most Kashmir activist Facebook users have changed their profile pictures to graphics displaying pro-freedom messages like ‘Saeni kasheer-ay kya baneov? Alvida saeni shaheedo!’ (What has become of our Kashmir? Farewell Oh martyrs! )’, ‘we may forget every crime of India in Kashmir but how can we forget the night when eight year old Yasmeena was raped thrice by troopers’. Shivali Verma (name changed) who lives in New Delhi and has been in Kashmir last year says when she logged in to her Facebook account back home she was astonished to see all her newly made Kashmiri friends with pro-freedom, anti-India pictures and posts in their profiles. She confesses she has mixed reactions about these messages written on Facebook; “I felt strange because we are more used to see encouraging slogans and all this is very de-motivating even derogatory in a way,” she said on Facebook chat. Continuing the curbs on freedoms the government banned Short Messaging Services (SMS) which has added to the chaos and tension among the youth and led them towards the internet to vent their anger. The ban was imposed by the state government on security grounds because people have been messaging each other regarding protests which the government says is “spreading false rumors”. The ban affected many people beyond the valley, such as Saqib Bhat (name changed), a photo journalist working in New Delhi, far away from his close friend studying here in the valley. “SMS ban is a serious issue as the curfew keeps everyone jailed at home. We are even denied of the right to express the pain of separation with each other,” he said. Even phone services are active in other parts of valley but in northern areas phone services are banned.